K Tom. Try not to burst out in tears. It's not the end of the world. Bubble tape is a good thing. You ask for it every time we go to the Dollar Tree. Silly kid. Again, he's my "never pleased" child. He wanted a toy. 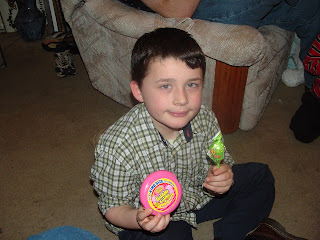 But of course, he probably wouldn't have liked any toy that he would have gotten from the Dollar Tree. Or he would have been mad when it broke (cause they always do). About 30 minutes later, he was thoroughly enjoying his gum, and pleased as punch. He needs to learn to "fake it" better for pictures, I guess.